It’s hard to open the newspaper or watch the news without hearing something almost daily about foreclosures. Maybe you’ve even looked at some of these properties either for your own use or as an investment property. If you have been looking than you’ve probably noticed that most of these houses need a lot of work, with roofs, kitchens, heating systems all seeing better days. Makes you wonder how all that work will get done, especially if you’re not all that handy. It just so happens that the Fed’s have a great program to cure what ails these rundown houses. 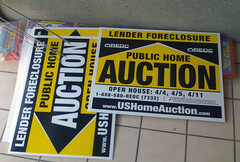 There are some great bargains right now in foreclosed homes but they often aren’t in the best of shape. Fortunately, the FHA’s 203(k) program allows you to both buy a house and fix it up with a single mortgage loan. The FHA 203(k) mortgage is designed for fixer-uppers. You can borrow up to 110 percent of the expected value of the property after renovation to pay for both the purchase and home improvements. You can even do the work yourself, provided you’re qualified to do so, although the FHA will likely insist that you hire professionals for more demanding projects. Foreclosed properties can be in poor condition for a number of reasons. To begin with, if the previous owners couldn’t make their mortgage payments, they probably didn’t keep up with routine maintenance either. Second, foreclosures often stand vacant for a long time before they are purchased, and may deteriorate during that time. Finally, homeowners facing foreclosure sometimes remove appliances and other items of value, or simply damage the property to spite the bank. On the plus side, these are some of the reasons why foreclosures sell at a discount in the first place. Quite often, they can be purchased and put back into shape for considerably less than you would spend on a conventional home purchase with only minor upgrades needed. There are two types of FHA 203(k) loan. If the home only needs modest improvements, like a new roof, new appliances, kitchen remodeling, repairs or upgrades to heating, electrical and plumbing system, floor repairs, basement refinishing and the like, you can apply for a streamlined 203(k), also called a modified 203(k). This will allow you to borrow up to $35,000 with more simplified application requirements than on the standard 203(k). The standard FHA 203(k) is used for more extensive improvements, those costing more than $35,000 or involving structural work. This might include adding an addition, repairing structural damage, moving a load-bearing wall or any kind of work that involves detailed drawing or architectural exhibits. In either event, the maximum you can borrow is either 1) the total of the purchase price and planned improvements, or 2) the estimated improved value of the home plus 10 percent (110 percent of the improved value), whichever is the lower of the two. In any event, you’ll need an appraisal done to calculate what the improved value will be. In addition, you’ll need to prepare a work plan showing what you plan to do and the cost of the materials and labor. You can do the work yourself, but must show that you are qualified to do so. In addition, you must include a provision for the cost of the labor, so that you can pay to have the work completed by professionals if you are unable to do so in a timely manner – you’re allowed six months for do-it-yourself projects. The FHA 203(k) loan program is limited to owner-occupants – you must live in the home once renovations are complete. However, the loans can be used to purchase and improve multiunit homes of up to four units, provided that you make one your residence. The loans can also be used to divide a single-unit home into multiple units, or turn a multiunit property into a single-family residence. Not all FHA lenders deal in 203(k) loans, so you may have to do some looking around to find one who knows how to handle them. You can also expect a somewhat longer closing period than on a regular FHA mortgage, usually about 45-60 days. So now you have no more excuses. Get out there and start making offers.